Both born of a British family in Tokyo, 1916 and 1917, just 15 months apart, uniquely Olivia and Joan grew fast but totally independently of each other into major stars during Hollywood’s ‘golden age’ of the studio system. Apart from obvious “superior breeding” that was fashionable on stage and screen up to World War II in the gentlewoman type they did have in common, they didn’t have much truck with each other and the fan magazines of the day hinted at an estrangement, even something of a feud, offscreen. Apparently, in real life, “feud” didn’t nearly cover it and from early childhood Olivia was unaccountably resentful and anything but nurturing towards her younger competitor. A cousin, the high achiever of the family, designed de Havilland aircraft. From age 18, Olivia was seen as a promising starlet by home studio Warner Brothers, winning leads in her opening year, 1935, in both A Midsummer Night’s Dream and Errol Flynn’s first starrer, Captain Blood. 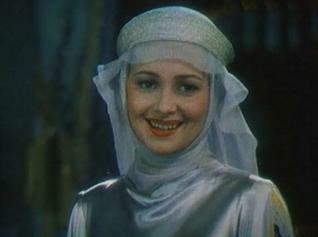 While Flynn was an instant superstar, Olivia, just as impressive, was on a slower rise through Maid Marian, exquisitely beautiful in The Adventures of Robin Hood (1938) — see photo. In David Selznick’s mammoth production of Gone With the Wind the following year she took a step up entrusted with the difficult role of long-suffering Melanie Hamilton — hard not to make her an over-saintly martyr, which she accomplished. Nothing could save her from the overwhelming shadow of the media hooplah surrounding Vivien Leigh in the prime role of Scarlett O’Hara. Each received $25,000 for appearing — Vivien as a one-off newcomer’s fee from Selznick; Olivia for 20 weeks work from Warners, at her normal studio salary of $1,250 a week. Neither compared to Clark Gable’s (Rhett Butler) lump of $120,000 from home studio MGM, who distributed the picture as their price for lending Selznick the prime leading man of the day, who incidentally suited the role down to the ground. While Vivien went instantly on to $100,000 a picture for her next one, this distinctly secondary treatment still after four or five years with her studio meant Olivia would never quite measure up as the heiress apparent to Bette Davis’s status as Queen of WB. Joan wasn’t really as beautiful but was slender, blonde and held herself with ultimate poise, like a mannequin — something of a forerunner to the ladylike appeal of Grace Kelly and Audrey Hepburn but more demure and completely lacking their coy coquetry. Joan’s wry smile did show a sly sense of humor though, giving portrayals somewhat more subtle than her elder sister without showing an “acting” performance that Olivia would develop mostly after leaving Warners. And whereas Olivia played fresh and bright on screen, sometimes passionate, Joan looked world weary, even cynical as she matured. In the meantime Joan had made a slight impression at her home studio of RKO as Douglas Fairbanks Jr’s leading lady in Gunga Din (1939), a somewhat better one in MGM’s The Women later that year and then (dropped by RKO) went straight into major stardom in the title role of Rebecca (1940) squired by Laurence Olivier, and Suspicion (1941), wife and potential murder victim of Cary Grant, of questionable background and character here. 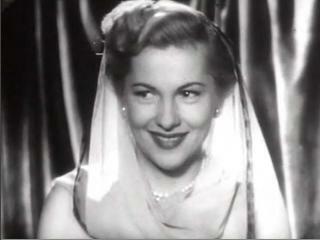 She had signed with driven independent producer Selznick, he fresh from the stupendous achievement of Gone With the Wind and both her triumphs were under the most prestigious director of the time, Alfred Hitchcock. Unlike big sister Olivia she was the center of attraction in her movies at 22, and having won the Oscar as Best Actress for the second one — the only one ever for a female under Hitchcock’s direction — she was already overshadowing her. Posterity would not record it thus. This Above All was a little dreary though highly admired as an RAF love story with Ty Power. In a remake of The Constant Nymph (1943) she took acting honors from the likes of Charles Boyer, Dame May Whitty, Peter Lorre — and shot under Olivia’s nose at the Warners lot. Jane Eyre (1944) with Orson Welles, who did not direct, was a good atmospheric piece and she was moving in the role, compassionate to Rochester’s tortured soul. After that, though she continued as center of attention in comedies and period adventures alike, there was usually something light and fluffy about them, ultimately dismissable though shot attractively with Joan looking glamorous. This applied even to a Billy Wilder ‘classic’, The Emperor Waltz (1948), sumptuous in technicolor and opposite Bing Crosby, and a deadly dull period thriller, Ivy, playing a poisoning murderer, and still unfailingly glamorous. Letter from an Unknown Woman that year was a four-star exception directed by legendary French auteur Max Ophuls and written by Howard Koch, admired even by usually vitriolic critic Pauline Kael. Out on her own, freelancing, she emulated her sister in winning an Oscar: wartime tearjerker To Each His Own made with flair at Paramount by stylish Mitchell Leisen. She made a decision that must have been a personal breakthrough, to take on unflattering but impressive roles that minimized her beauty to say the least. In The Dark Mirror at Universal she played good and bad twins, one a murderess; at Fox, The Snake Pit as a victim in a mental hospital; and again at Paramount, The Heiress as the homely dupe of young Monty Clift playing a ruthless social climber; she was 34, he was 29. For the last two she won the New York Film Critics award for best actress of 1948 and ’49. She was off the screen for three years, at 35 again daringly playing the older woman coming back opposite Richard Burton, 10 years younger. Though always more popular in stars’ polls, now Olivia had caught up with her sister in theatrical status, effectively surpassed her in outlasting her, and finally relaxed. In real life, she switched husbands and went with the new one to Paris, satiating her acting bug with just occasional roles. In the mid 1960s she emulated Bette Davis and Joan Crawford in turning to grand guignol just short of real horror, Lady in a Cage and Hush, Hush Sweet Charlotte, replacing the ill Crawford to play opposite Davis in the latter. As far as I know both still survive approaching a century, and the sibling enmity still glows white hot.